It was October 9 and I was standing in Wal-Mart in Detroit Lakes when our world came crashing down around us. No one expects to hear the word “cancer” in the same sentence as your child’s name. I can’t describe the instant devastation or the crushing fear that surrounds you like a heavy wet blanket. Our lives since that phone call have been a roller coaster of ups and downs, lots of sadness and tears, but also good times that brought laughter, hope, and tears of joy. Many of those good memories surrounded the Tyler Toy project sparked by one young man’s dream of restoring his baby and one forum’s generosity in helping realize that dream. To really understand the full picture of this story, we have to go back to when Tyler was 15. He began looking for a car and landed on the Fiero. Because this is coming from a mom’s point of view, I won’t have a lot of mechanical technical reasons behind this fascination, but I do remember him scouring the internet looking for the perfect deal. Our entire family made the treck to Fargo one day to look at a car. We stopped and looked at it, he drove it a couple of times, and we left to go for supper. The minute we left, he wanted to go back. His heart was set on this red 84 Fiero manual 4 cylinder car. His mom’s was not. I gave him all sorts of reasons to not buy this car. First it didn’t run very well. Second, where will you put your ATV, your snowmobile, your dirt bike I asked him? I told him he needed a truck. Much to my dismay, we went right back and bought that car. The grin on his face looked like a permanent fixture and so a Fiero-head was born. He tinkered with this car quite a lot and had the motor out and in a couple of times. This is not something I really paid too much attention to. Tyler was a mechanic, the sort who learned at his dad’s knee from the time he was old enough to hold a wrench. He was always tinkering with something. He happened on his next Fiero purchase as a fluke. It was in a field and the owner thought it was blown up. Tyler got it for a steal - $125.00. He got it home that day and after tinkering for just a short while discovered much to his amazement that it was a spark plug that was causing the car not to run. He told that story to anyone who had ears. There is nothing better than landing on the ultimate “deal.” He even made that spark plug into a key chain. The first Fiero was sold to his cousin and the 86 Fiero GT became his daily driver. In this timeframe he also bought a parts car. By this time, this mom was afraid her yard was going to become looking like a junk yard. Tyler worked on this car off and on, replacing parts here and there as he could. Not a whole lot of progress was made as far as getting it in “mint condition,” but Tyler was happy with it nonetheless. That was one thing about Tyler that really stands out to me. He was happy with what he had. Oh, once in a while, he would get frustrated with having “old junk,” but as a whole he enjoyed what he had and there was never any shortage of fun. He was just as satisfied with his 20 some year old car as he would have been with a brand new one. That is a lesson we all should take to heart. Shortly after being admitted to Roger Marris Cancer Center in Fargo, ND, we were told Tyler’s cancer was not responding to any of the treatments and he was terminal. At this point, he was in too much pain to even get out of bed. One of the last times in the hospital that physical therapy attempted to move him he had so much pain he was actually screaming out in agony. We were all feeling completely helpless. It was about this time that Tyler posted on PFF asking for some help with parts for his car before he “passed.” (See post here) We didn’t even know he did that until after the fact. From there it was a whirlwind of responses starting of course with Andy (Hulki) getting the ball rolling from Iraq. Never in a million years would we have expected the amount of parts, money, people, time that was offered and never in Tyler’s wildest dream did he ever expect to see his baby restored to the state it is in now. We took Tyler home by ambulance ride because we could not get him out of bed, but once we got home his typical determination kicked in and it wasn’t long before he was out of bed and in his wheelchair. I still greatly believe this rapid turn around was due in large part to his great excitement in seeing his car project. He kept up on all the internet activity in great anticipation of the day of the build and put quite a lot of time into picking out the color for his car. We tried to keep that under raps, but word quickly spread that he wanted Corvette yellow. All of Tyler’s other toys are yellow too - ATV and snowmobile. Ski-Doo/Bombadier are definitely the favorites and Arti-Cat is a swear word in our house, so yellow was not as surprising to us as maybe to others. Our whole community waited in anticipation of the big day as well and we had much local participation and support. This was not a shock to us. My husband was born and raised here and I have lived here for going on 22 years. We knew our town was terrific. This just showed the rest of the world how wonderful down-home living can be. The night before the build, we all met in Vergas for drinks and supper. It was pretty overwhelming to see all the strangers there to help with this project. We had never met any of these people before and it was difficult at this point to really get to know them. Our focus the entire time Tyler’s car was being worked on was Tyler. Was he comfortable? Did he need something to eat/drink? Did he look tired? The car project, while fantastic, was always secondary to what was really going through our minds…. How much time do we have left? The day of the build Tyler hung out in the garage the entire day and into the evening. We brought his recliner so he could sit comfortably and he had some of his friends by his side to support him and have some fun. The only thing that really just broke my heart was knowing that Tyler must have been thinking that he wanted to get up and help and he couldn’t. He was never a kid to sit on the sidelines. If something needed doing, he was right there in the thick of things. But watch he did. Not being a car person, I was amazed that when I arrived the entire car was in pieces. It was scattered everywhere all over Dave and Karen Gray’s autobody shop. Everywhere you looked there was a part and people working like busy bees. The activity was focused, determined, and fast-paced, but everyone was smiling and joking at the same time. The reporters were everywhere. Being able to talk to Andy (Hulki) via satellite feed was tremendous. Tyler thought that was special. None of us expected the plaque with Tyler’s likeness on it either. Much of this day for me personally was spent trying to fuss over Tyler and Tyler not wanting to be fussed over. In that moment, he wanted to be a regular kid without cancer just hanging out with some fellow Fiero-heads working on a car and you guys gave him that. One of the highlights of Tyler’s day was getting a ride in Pete’s stars and stripes car. He went outside with Jay and looked at every Fiero there. We had never seen so many Fieros in one place. That night I don’t think Tyler slept at all. He had some friends stay the night and was up at the crack of dawn. The reason I mention this is because prior to this Tyler had been sleeping in to midmorning and it would take a couple of hours before he was ready to get out of bed. Not that morning. He was up and out of bed in no time flat. We waited anxiously in the high school parking lot and had to laugh when the theme song for Overhaulin’ started playing with the fog. Overhaulin’ was one of Tyler’s favorite shows. I think our jaws just about hit the pavement when the car came out. I think we all had a little part of us that didn’t think it could be done. In 24 hours, Tyler’s Fiero became Tyler’s Toy. He circled the car and looked and had the biggest smile. When he decided he was going to drive it himself, we were more than pleased. He hadn’t driven since he was diagnosed. It took us a little while, but he got back behind the wheel and took it for a spin along with the other Fiero drivers. I remember standing in the parking lot, freezing my buns off, and wondering why they weren’t coming back. Come to find out, Tyler’s Toy quit running and all the Fieros were pulled over on the side of the road. In true Fiero fashion, the roadside mechanics jumped out to get him up and running. That was the funniest thing that happened all weekend. We all got a ride, even mom, in Tyler’s Toy. After that day, excitement shifted to putting in the new motor. Tyler drove the car after the build weekend, but he was having a hard time keeping it running. He actually did before the build also. Again, I am not a mechanic and cannot tell you exactly what those problems were, but it was enough that he was worried about driving it and getting stranded. To an average boy his age, that would be no big deal, but we couldn’t chance it with him in his condition. Stuart Restad had visited Tyler at our home before the build weekend and visited with Tyler about working on putting in a new motor for him. He took him for a drive in his wife’s Fiero, which had the same motor he was offering to put in. Tyler was enamored of the power. What is it with boys and fast cars? There was the concern something wouldn’t go just right and the car would be put out of commission until it was too late. Everything at this time in our lives centered around the fact that time was quickly slipping away from us. Fortunately all went smooth. Jay and Tyler spent quite a lot of time over at Stuart’s shop with the motor swap crew watching the progress. Again, I’m sure Tyler would have liked nothing more than to just get up and start wrenching, but he took sitting on the sidelines with a good attitude and a smile. Once the motor swap was done, Tyler was on the road. He took his friends out for drives and put on about 200 miles before he died and enjoyed every last second. There were days when he had the car parked on our front lawn so he could just see it out the window, like an old friend. Shortly before he died, Jay put NOS in for him, which had always been a dream of Tyler’s. Sadly, the last day Tyler got to drive his car, the NOS didn’t work. He didn’t care though. He just drove that car as fast as it would take him up and down the tar by our house. I could hear the motor from our yard. Some might say it was irresponsible of us to let Tyler drive. He was after all on a constant drip of narcotics and in fact the state of Minnesota took his license away. If he had gone off the road and died in that car, I would have had no regrets. He was doing his best to enjoy the things he loved and never got bitter about the limitations his life had suddenly left him with. He by far handled his cancer and impending death better than anyone else, especially Jay and I.
Tyler decided he wanted to buy his sister a Fiero to have after he was gone as well, so he sent Jay on a fishing expedition in Minneapolis/St. Paul and Jay came home with a red 86 Fiero SE automatic for Cassidy. Tyler drove that Fiero many times as well. Tyler’s Toy was always slated to go to Carter and the brothers spent many hours discussing this. Carter would sleep by Tyler when he didn’t have school and the contest was who could stay awake the longest - it sure wasn’t me. The boys had many in depth discussions about when Carter grew up and that he had to be a good boy to earn the privilege of having a car. The fact that Carter won’t have that big brother guidance in his life anymore seems the most unfair of all. A couple of weeks before he passed away, the importance of his car faded. He still liked to talk about it, but you could tell it was time to focus on other things. Jay worked on the NOS to get it functional, but Tyler never got to try it out. This is something Jay thinks about a lot. We lost him on February 14, 2010. My daughter Cassie said Tyler got the best Valentine’s Day present of all - he got to meet Jesus. The First Annual Tyler Shipman Memorial Car Show was held July 24 in Frazee, MN, coinciding with the town’s annual Turkey Days festival and the Frazee all school reunion. We were more than a little surprised when the idea first was brought up for a memorial car show in Tyler’s name. To see it actually come to fruition was something that I cannot put into words. It helped us have a good thing to look forward to, a way to honor and remember or son, and a way we feel will keep his memory alive in years to come. It was a tool in our grieving process and has allowed us to become a part of a community of people we will be honored to call friends for the rest of our lives. It wasn’t until the car show weekend at our house that we got a chance to really meet the people who helped with Tyler’s car, and to say we had fun is a pretty big understatement . The car show raised $1600 for cancer research and brought once again our entire community together. After the first car show, this mom finally “got it.” I started to understand the love of these cars and was officially bitten by the Fiero bug. I bought my own a few weeks ago - 85 Fiero SE manual. I would like to think that Tyler has sent a little of his car madness my way. I am totally enamored of the Fiero community and the cars. For me, it has been a way to connect with a part of Tyler’s life that I didn’t experience with him when he was alive. While I wish I could go back and discover the fun he had with these cars with him, it does makes me feel connected to him now in a way that nothing else has. Jay and I also made the long haul down to the Heartland show in Davenport with Tyler’s Toy and got to stay at Fred and Annette’s place. We had an extremely good time. 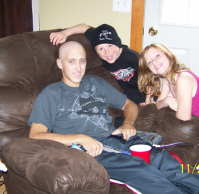 We continually hear from members of the Fiero community how inspiring Tyler was to them. While I agree my son was more than awesome, what they don’t realize is Tyler’s Toy wasn’t just about Tyler. Tyler’s Toy is a symbol of how good people can make a difference. Tyler’s Toy is a symbol of hope, selflessness, and perseverance. Tyler was a good kid, not a perfect kid, but he was our kid. He was kind, generous, smart, funny, and a friend to many. He was loved and will be missed. His legacy to us is not a car but all the memories of a life well-lived. Your legacy to our family is not a car, but the knowledge that everyday heroes are all around us and we have been privileged to be able to meet some of them and call them friends. Much love and thanks to our Fiero family!